Supermarket chain Morrisons has launched a £3bn ($5.2bn) bid for rival Safeway, a deal which would create one of the UK's largest supermarket groups. The 283p a share offer is expected to bring the Safeway takeover saga to a close after nearly a year of battle. Chief executive Sir Ken Morrison said the move was a "transforming step"for the group. But the firm said about 1,200 non-store staff were expected to lose their jobs as a result of the takeover. News of the increased offer comes almost a year after Morrisons first made its initial all-share £2.9bn bid in January. After Morrisons launched its initial bid, the other main UK supermarket chains - Tesco, J Sainsbury and Wal-Mart-owned Asda - all entered the battle. The bids were referred to the Competition Commission to see the takeover of Safeway could lead to one chain wielding excessive power. The Commission blocked the bids from Tesco, J Sainsbury and Asda, but cleared Morrisons; bid on the condition it sold off 52 of Safeway's stores. Unlike the earlier deal, Morrisons' latest offer comes with a cash element - 60p per share - designed to appease stockholders disappointed that the original offer was made entirely in shares. The sale of the 52 Safeway stores is likely to fund the sweetener. Under the deal, Bradford-based Morrisons expects to find annual cost savings of some £215m, compared with an original estimate of £250m. The combined firm will have 552 stores generating about £13bn of sales, Morrisons said. 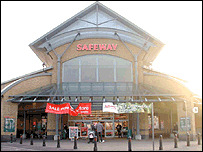 Sir Ken added: "The logic of combining Morrisons with Safeway is every bit as powerful today as it was a year ago. "It a matter of great priority that we get cracking. Safeway has suffered for the last 12 months while there has been uncertainty." As a result of the deal, Morrisons will be able to take advantage of Safeway's strong positions in Scotland and southern England while continuing to exploit its own strength in the Midlands and north of England. Family-run Morrisons, currently Britain's fifth-biggest food retailer, said its offer represented a 33% premium to Safeway's closing price on January 8 - the day before its initial bid. The company also revealed that Sir Ken will remain executive chairman of the enlarged group, and that current Safeway directors Lawrence Christensen and Jack Sinclair have been invited to join the Morrisons board. Morrisons added it had not been distracted by the protracted takeover struggle, with like-for-like sales up 9.6% in the 17 weeks to 7 December. By the close of trade, shares in Morrisons were up 6.5p, or 2.9%, at 229.5p, while Safeway shares ended 4.75p higher at 288.5p. "Morrisons swoop will shake up food retailing"
What now for Safeway suitors?